The last few weeks I've been kept busy with last minute gift shopping, long and busy work days, and trying to get enough sleep to get through it all. I did the majority of my gift buying online this year, because going out to stores once was enough to remind me that I don't want to be anywhere near people or retail establishments this time of year. I'd say I've been pretty successful in keeping my sanity, despite 9+ hour work days, not-quite healthy eating habits, and other peoples' insanity. 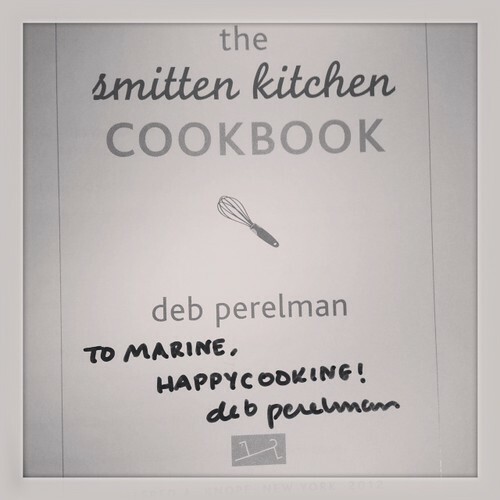 The highlight of this past weekend was getting to meet Deb Perelman of the food blog Smitten Kitchen. I've been following her blog for over five years! She recently put out her first cookbook, with all new recipes, and I saw that one of the stops on her book tour was our local Barnes & Noble. The signing was on a Sunday though, and I usually work Sundays so I didn't think I'd be able to make it. Imagine my surprise upon looking at my calendar and realizing that her book signing was on Sunday, and as luck would have it, I happened to have the day off! So I trekked on down to Barnes & Noble and waited in line with dozens of other people, all of us clutching our copies of her book. She was so nice and all smiles, and she actually wrote down the name of the bakery where I work and seemed genuinely interested in stopping in at some point. Now I only wish I could have made it to one of the Young House Love book signings when they were in the area... damn you, Hurricane Sandy! Watching: We just finished the latest season of Psych and have also been working our way through the latest season of How I Met Your Mother. On my own time, I've been re-watching the many seasons of Malcolm in the Middle. I love Netflix. Listening: Shawn switched up all of the CDs in the car so I've been hearing a lot of Don Henley, Bon Jovi, Santana, and Blues Traveler lately. And at home I've been turning on the Supertramp station on Pandora. Reading: This category actually deserves its own post - I've read 16(!) books this year and I so want to talk about all of them. Right now though, I just started reading Orange is the New Black by Piper Kerman. It's a memoir of her time in a woman's prison. Not what you'd expect! Offline: I've mostly been wrapping gifts and sleeping. I can't seem to get enough sleep these days - I go to bed at 8:30/9pm lately! But, I do wake up at 5:30am most days, and don't sleep past 6:30am on my days off, so I guess it's only natural to be dozing off early. I can't wait until the holiday season is over... I love my job, but I could sure use a break after these past two months.